Home / Uncategorized / HOW CAN WE HELP? At Friend of Water we provide solutions for a wide variety of customers and their various needs. Below is a list of some specific examples of the solutions we provided for customers. What they all have in common is that we help them find the right solutions for THEIR specific situation. A man from California called to order a cooling vest for the summer. He’s a motor cyclist who travels the country on his bike. He needs to stay cool for several hours in the high heat and winds. He was very happy with our selection of cooling clothes and our helpful customer service. A woman from Missouri who has MS (Multiple Sclerosis) called to order a cooling vest for the 30 mile walk she will embark upon next month. She’s planning to have stops along the way to soak her vest when it needs a renewal of cool water. A man from New Jersey, who lives in a neighborhood where there are many smokers, often smelled cigarette smoke in his apartment. We suggested he get the Aqua Air Purifier for his apartment. He recently let us know that he is very happy with the air quality in his place now. A mother from Illinois called us to order an Aqua Air for her family’s home. Her 3-month old baby who is struggling with congestion, particularly at night time, is having trouble sleeping, and so the whole family is too. Now, every night before she puts her baby to bed, she turns on her air purifier in the baby’s room, and sometimes adds a few drops of calming essential oils. Their baby’s breathing has already improved. The mellow hum of the purifier actually helps the baby to stay asleep as well! A couple from Florida who have 3 children called to order shower filters for every shower in their home. Their city’s treated water uses chlorine as a disinfectant, and their children’s skin reacted negatively to this chemical. After using the shower filters the children’s skin no longer broke out in rashes. They get refills for their shower filters every year. Another mother from Texas, who has 2 toddlers and a new born baby, purchased our bath balls to remove chloramine from their bath water. She is grateful to be using filtered water. She renews her bath ball discs every 12 months. 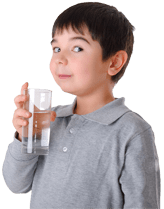 A young man in San Francisco who runs a small Juice bar, ordered our Undercounter Water Filter- FLUORIDE Chlorine Plus in order to provide filtered water for washing dishes and serving customers for his business. He reorders the fluoride canister every 6 months, and the wide spectrum filter every 12 months. A woman from the UK ordered the Countertop Xtra Protection, FLUORIDE, Chlorine Plus for her drinking water at home. She is already feeling the beneficial effects of her clean water. These are just a few of the many stories that we hear from satisfied customers. We would love to help you find the right product for you!